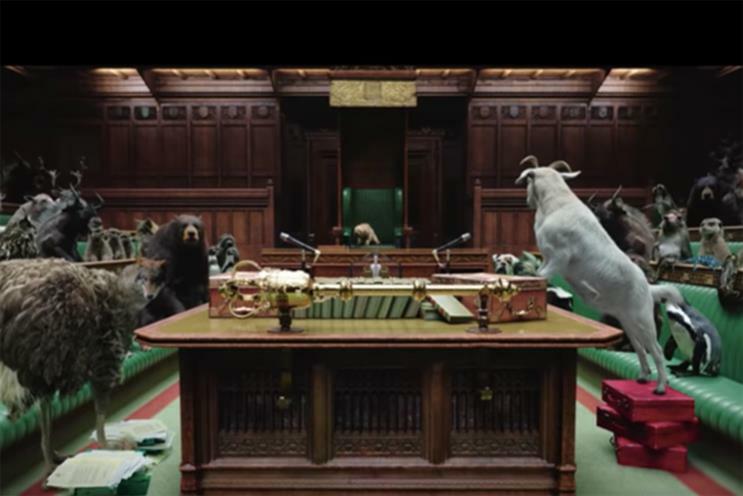 News UK’s literal interpretation of the "Westminster Zoo" has received a roar of approval as the winner of the latest Thinkboxes Awards for TV ad creativity. With the countdown to Brexit gathering pace, The Times and Sunday Times wanted to burnish their credentials as the go-to media in a frantic political environment, said Catherine Newman, chief marketing officer for the papers. "We set out to cement The Times' and Sunday Times’ position as being number one for political news, reinforcing the trust people have in them and providing some clarity and wit around a serious situation." Briefed in November for a campaign that was to run in the first quarter of 2019, Pulse Creative worked fast to come up with a theme that focused on bringing order from chaos. The result was ‘Politics. Tamed.’ which used real animals, superimposed into the House of Commons chamber, to represent feuding political factions. Pulse Creative executive creative director Robin Garton said a single image of a hyena outside of 10 Downing Street sparked the creative theme. "It was powerful and striking, clear and simple. The whole campaign – which became integrated, with TV at its heart – came out of that single image." Actor Jason Isaacs narrated the Dr Doolittle song ‘Talk to the Animals’ over the ad, which culminates in a majestic lion and unicorn bringing calm to the menagerie as they enter the Commons. "The lion and unicorn are on our crest, which means it is also a visualisation of how, as a brand, we bring order," said Newman. "It’s not every day you get such a striking opportunity to do that." The Thinkboxes Awards for TV ad creativity are run in partnership with Campaign and voted for by the Thinkbox Academy of senior creatives. The ads in contention ran in January/February. Second in the latest Thinkboxes Awards was "Tonight is to sleep" for IKEA by Mother. "Payback" for ITV & Veg Power by Adam & Eve/DDB was third. Also shortlisted were "The purse" for Guinness by Abbott Mead Vickers BBDO and "Speech bubbles" for Truth Project by MullenLowe. The Thinkboxes, in association with Campaign, are the only bi-monthly awards that celebrate the UK’s world-beating TV ad creativity, in all its forms. They are judged by the Thinkbox Academy – 200 advertising and marketing luminaries who have been involved in award-winning creative work for TV. Find out more about Westminster wildlife and the making of the ad in the April issue of Campaign. Thinkbox is the marketing body for commercial TV in the UK, in all its forms. Its shareholders are Channel 4, ITV, Sky Media, Turner Media Innovations and UKTV. Thinkbox works with the marketing community with a single ambition: to help advertisers get the best out of today’s TV. What warmed Trevor Robinson's heart this Christmas?